The details in this wedding are everything! In the world of dreamy weddings, this one was an insanely gorgeous soiree. 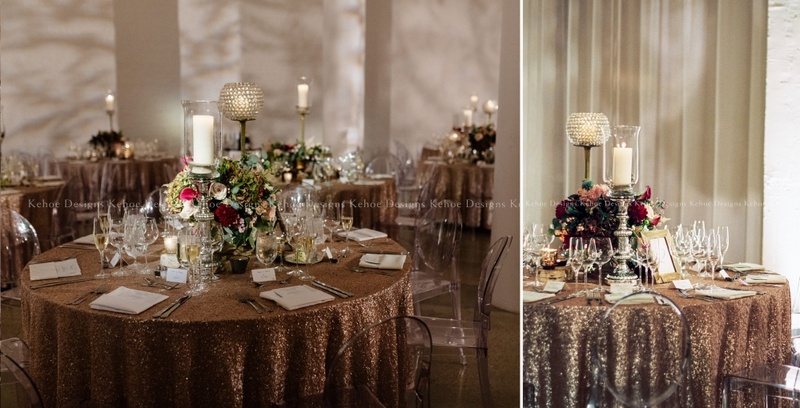 From the tiny details of calligraphy, to the glam sequin draped tables to the opulent vintage chandeliers, everything comes together to create a trendsetting wedding. 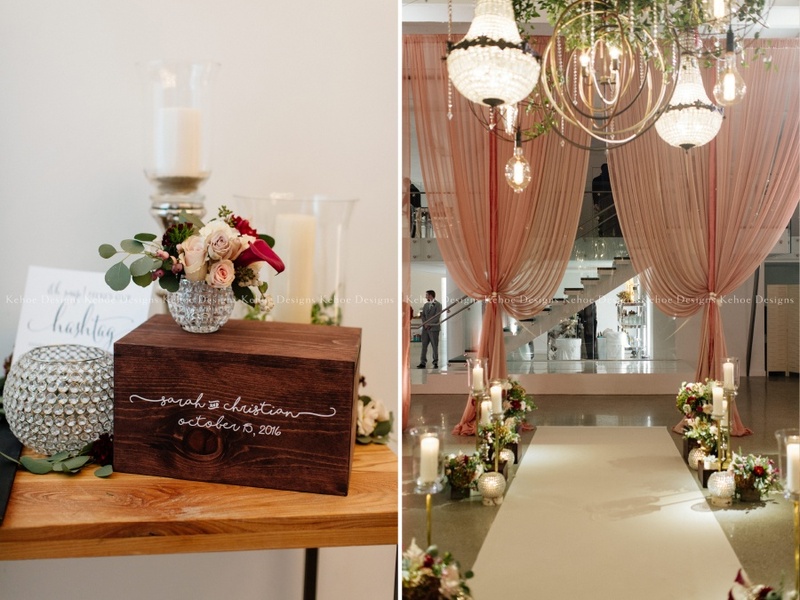 To create this jaw-dropping wedding, Kehoe Designs’ explored contemporary romanticism viewed through the vibrant eyes to today’s brides as they reinterpret treasures and up-cycled replicas that carry us back in time. 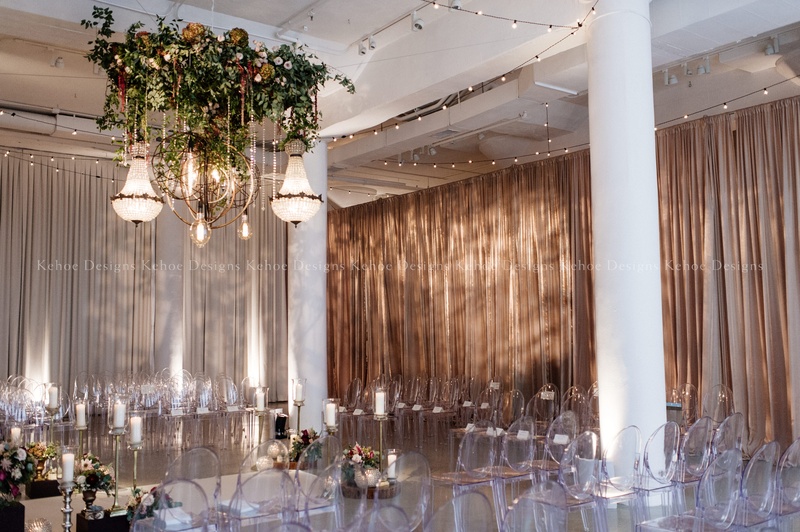 Suspended greenery with delicate hints of roses created a feeling of a wild forest in which antique teardrop chandelier’s, forged metal spheres, Edison blubs and shimmering glass garlands graced the ceremony. On either side of the aisle reclaimed wood slices became the riser for petite paves of floral, crystal hurricanes, and tall gold candlesticks delineated a triple wide runner in ivory linen. Double layered gold and champagne drapery separated the evening from ceremony and cocktail hour to dinner. With its Lucite chairs, warm candlelight and forward thinking floorplan – it has a refined, modern, and youthful aesthetic that continues to revel itself as the night goes. The intriguing dynamic nature is what makes this wedding so memorable. Can’t forget to mention the bubbly and glittery-like Champagne and Confetti BBJ Linen combo Cameo Classic and Cameo Tori. These linen acted as a statement piece of estate jewelry placed on rounds in the venue. Resting graciously on the linens were floral compositions that were crafted by Kehoe Designs’ experienced floral designers. They paired exotic flowers with standard garden varieties, unexpected herbs, and wild foliage. Renaissance inspired in classic urns, repurposed birch wood, and crystal globe hurricanes finished this very eclectic design. 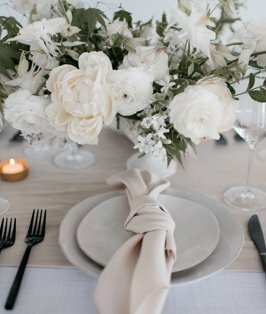 Kehoe Designs specializes in innovative, trendsetting weddings grounded in distinct artisanal vision and flawless execution. It is a studio where designs are bound only by imagination, its ability is comprehensive and forever mindful. Whether the look be timeless, modern, glam, rustic or contemporary, allow Kehoe Designs to be a part of your magical day and create your one-of-a-kind wedding! To begin your journey in the passion-filled world of event design & decor, contact Kehoe Designs.